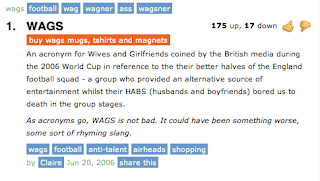 I've read up on WAGs and most people tend to hate them; they are synonymous with gold-diggers and cleat-chasers here in the states. However, Victoria Beckham is the reigning queen of WAGs and while she might have fake breasts, be too skinny for her own good and be dating a futbol player, she's Posh Spice, and you can't deny that. Here's the thing. Why should WAGs be reserved to only women dating soccer players? Why must they have a bad connotation? I mean, it is an acronym for "Wives and Girlfriends." I'm a girlfriend. I should be allowed to call myself a WAG and say it proudly. That is why, once I hit the big time, I'm determined to make WAGs a global phenomenon, something that women can say with pride and joy. However, I also think it should be a coveted title, something only fabulous WAGs can say they are. Let's say, hypothetically mind you, that you slap your boyfriend 10 times in a taxi in front of six of his friends. 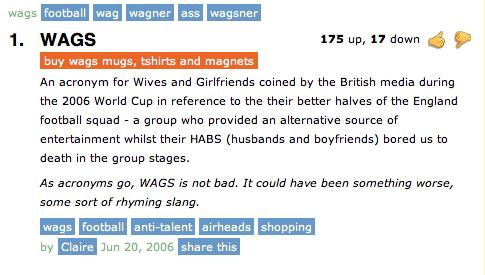 You are not a WAG. You are a hellacious, asinine girlfriend, a.k.a. HAG. If you can't go to a party, gathering, meeting or happy hour of sorts without starting a fight with your boyfriend, you are most definitely a buzzkill, or HAG. Woof. If you are sleeping with half of the fraternity that your ex-boyfriend is in, you would be considered a (slutty lay and/or girlfriend) SLAG. If you are dirty trailer trash with no grace, elegance or personality, you would be a RAG (as in trash). So you see? You have to earn your title to be a WAG. Live and let live, ladies.